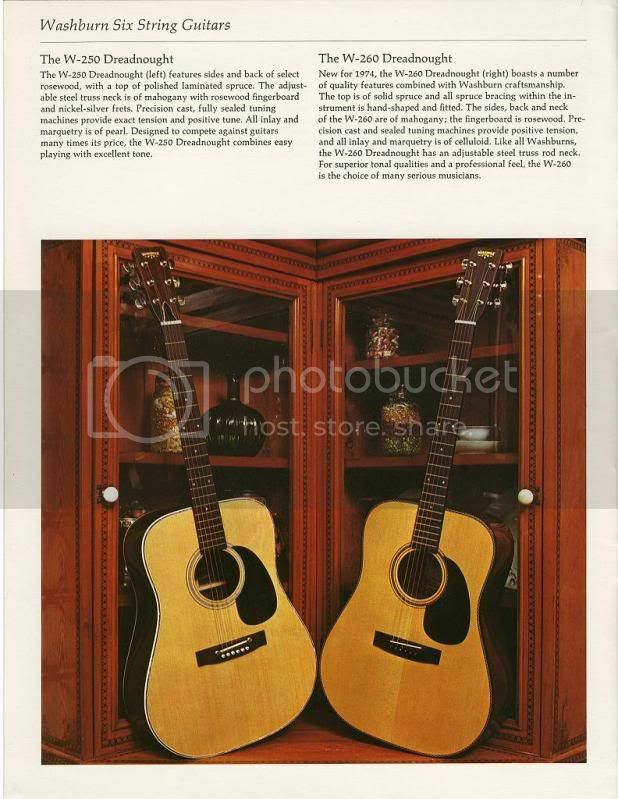 These are the first modern era guitars Washburn produced beginning in 1974. Imported by Beckmen Musical Instruments of Los Angeles, CA.. 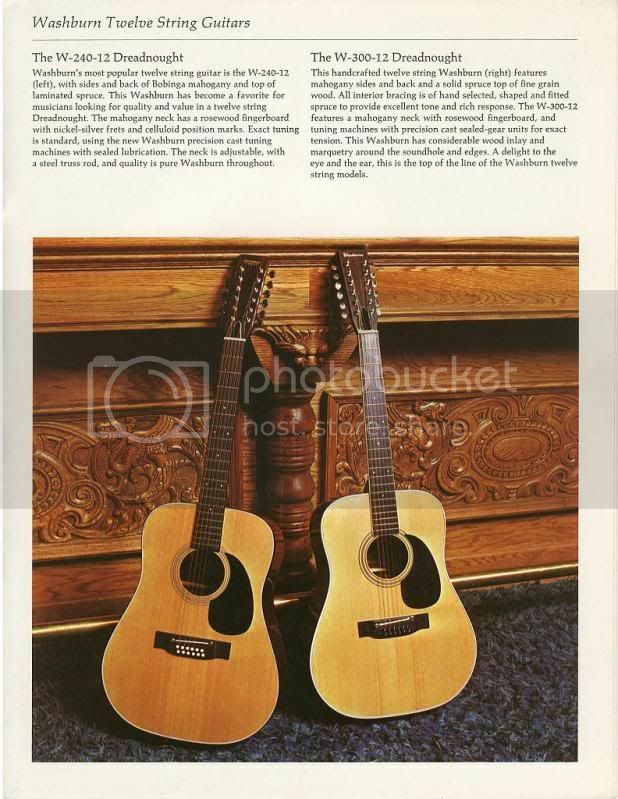 The spruce/brazillian rosewood W-600, partially shown on the first page, and also shown elsewhere in the Vintage/Rare section, was another of these. So that's where it all started... the Sofa photo's... although that does not look like a comfy sofa, the guitars look awesome! I'm a sucker for a traditional acoustic design, and the various wood grains are all unique. I'd love to see the sides and backs of these beauties. I'd love to see the sides and backs of these beauties. I have another early Beckmen import. 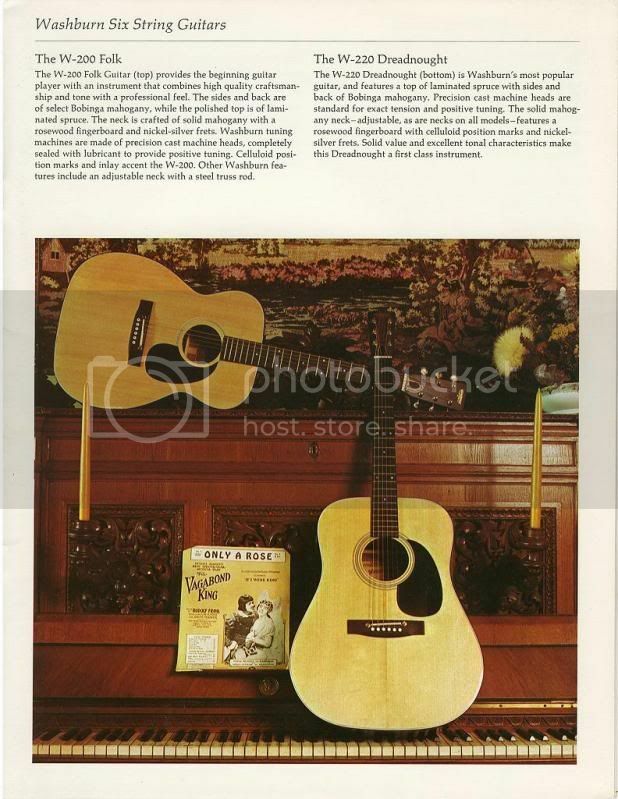 It is a 12 string dreadnought looking and constructed similar to the Washburn W-220 model.... the inside label reading in large block letters Delta (model name-as on the headstock) and below that Beckmen Musical Instruments Inc and made in Japan. The bridge has a trapeze tailpiece with bone saddle. Made, I assume in the early to mid 70's. What I am wondering if is anyone knows if it was manufactured in the same factory as these early Washburns and where that might have been in Japan. Graystar, welcome to the forum. Do a search on 'Yamaki', that's the factory that BMI imported from. How about some pictures? Maybe start another thread with 'W 280' in the title, that will probably attract some attention. google leads me to all of these places but i still dont know where mine came from. i'm at work today and dont have pics to include right now. anyone? am I posting right or is it that no one has an answer? Nothing wrong with your post, Shocker. Give it a week or so and see what turns up. Did you look at the thread listed 3 posts above, to see if it was of any help? Also check the search function to the right at the top of the page. good advice, I'll try those....thanks! Yes, I know, Zombie Thread Alert. However, I had someone ask me about a W-series dread, & this is like the ONLY authoritative thread I could find on the subject, so I figured it deserves a little resurrecting. Specifically, let me transcribe the ad copy to get rid of the little squinty letters. IMNSHO, they really don't stand out as particularly thrilling instruments, but that's partly the fault of the copywriter, who really didn't have much to work with. Therefore, I am grafting on the "missing" page for the W-500 & W-600. Handcrafted of select fine grain woods, the W-280 Dreadnought boasts a solid spruce top and hand-shaped and fitted spruce bracing to enhance the tone qualities of this fine instrument. With sides and back of mahogany, precision cast tuning machines and an adjustable neck, the W-280 also features carefully inlaid wood marquetry around the soundhole and edges. With traditional craftsmanship, the W-280 Dreadnought has been designed to provide powerful tone for the serious musician. Beautifully assembled and finished, the W-280 is the equal of instruments priced many times higher. Another handcrafted example of Washburn skills, The W-300 features a solid spruce top of choice, fine grain wood and a three-piece rosewood back with hand-fitted wood marquetry. Sides are also of rosewood as is the fingerboard on the adjustable steel truss rod neck. A slightly lighter tone than the W-280 Dreadnought, the W-300 is suitable for both the professional guitar player and the serious amateur. 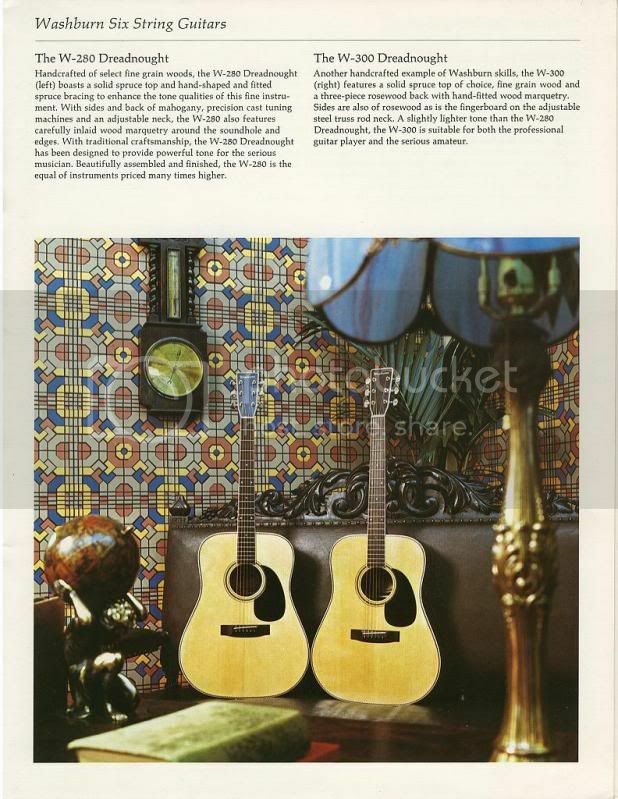 The W-250 Dreadnought features sides and back of select rosewood, with a top of polished laminated spruce. The adjustable steel truss rod neck is of mahogany with rosewood fingerboard and nickel-silver frets. Precision cast, fully sealed tuning machines provide exact tension and positive tune. All inlay and marquetry is of pearl. Designed to compete against guitars many times its price, the W-250 Dreadnought combines easy playing with excellent tone. New for 1974, the W-260 Dreadnought boasts a number of quality features combined with Washburn craftsmanship. The top is of solid spruce and all spruce bracing within the instrument is hand-shaped and fitted. The sides, back and neck of the W-260 are of mahogany; the fingerboard is rosewood. Precision cast and sealed tuning machines provide positive tension, and all inlay and marquetry is celluloid. Like all Washburns, the W-260 Dreadnought has an adjustable steel truss rod neck. 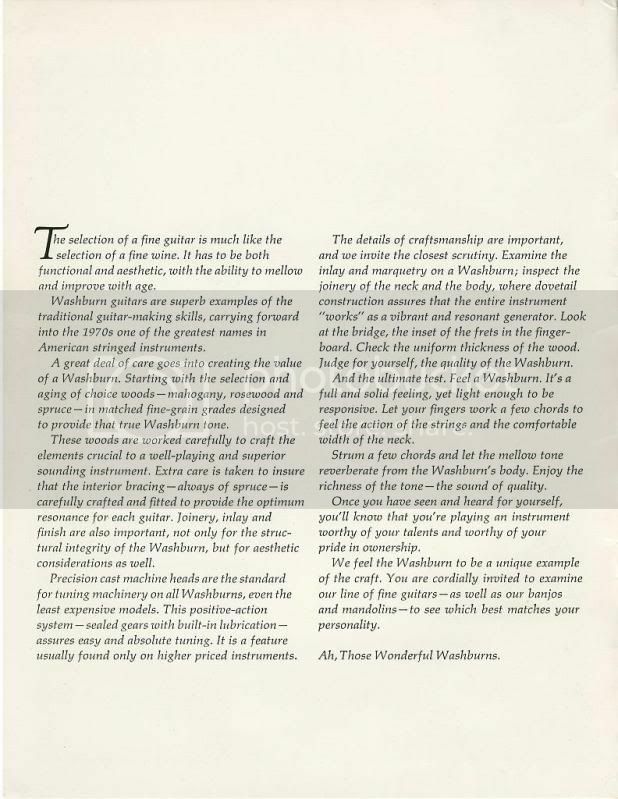 For superior tonal qualities and a professional feel, the W-260 is the choice of many serious musicians. Washburn'smost popular twelve string guitar is the W-240-12, with sides and back of Bubinga mahogany and a top of laminated spruce. This Washburn has become a favorite for musicians looking for quality and value in a twelve string Dreadnought. The mahogany neck has a rosewood fingerboard with nickel-silver frets and celluloid position marks. Exact tuning is sttandard, using the new Washburn precision cast tuning machines with sealed lubrication. The neck is adjustable, with a steel truss rod, and qualityos pure Washburn throughout. This handcrafted twelve string Washburn features mahogany sides and back and a solid spruce top of fine grain wood. All interior bracing is of hand selected, shaped and fitted spruce to provide excellent tone and rich response. The W-300-12 features a mahogany neck with rosewood fingerboard, and tuning machines with precision cast sealed-gear units for exact tension. 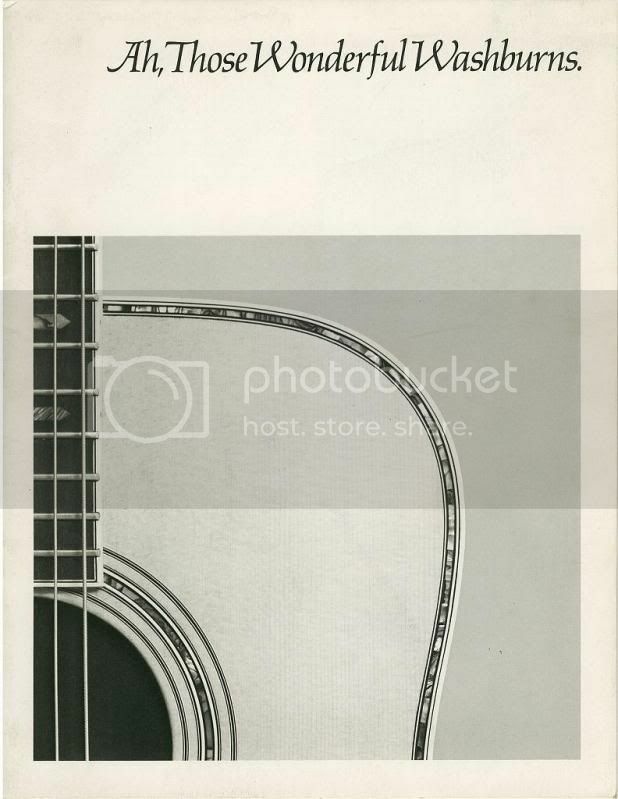 This Washburn has considerable wood inlay and marquetry around the soundhole and edges. A delight to the eye and the ear, this is the top of the line of the Washburn twelve string models. The W-200 Folk Guitar provides the beginning guitar player with an instrument that combines high quality craftsmanship and tone with a professional feel. The sides and back are of select Bubinga mahogany, while the polished top is of laminated spruce. The neck is crafted of solid mahogany with a rosewood fingerboard and nickel-silver frets. Washburn tuning machines are made of precision cast machine heads, completely sealed with lubricant to provide positive tuning. Celluloid position marks and inlay accent the W-200. 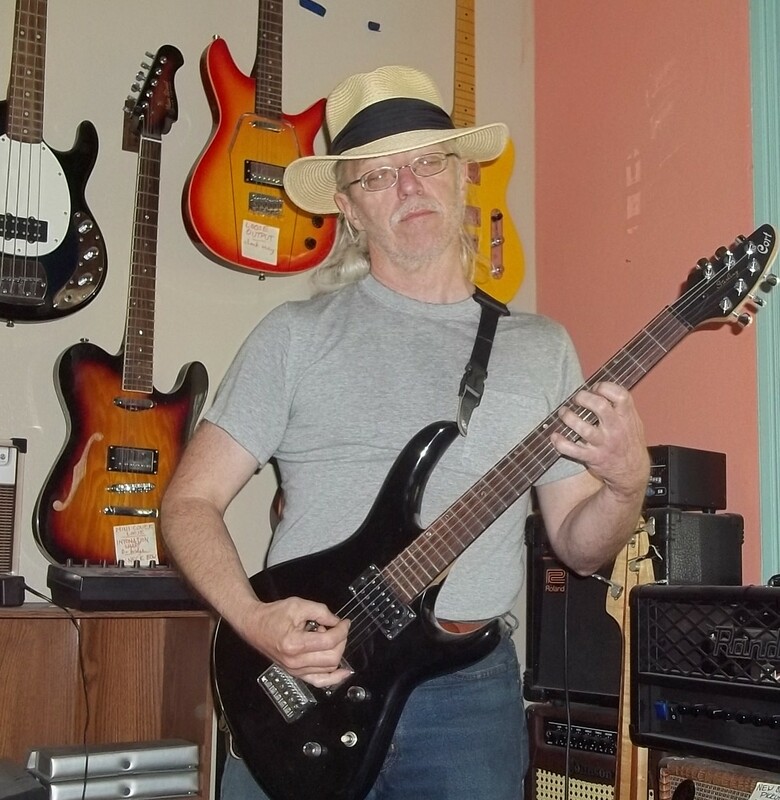 Other Washburn features include an adjustable neck with steel truss rod. The W-200 Dreadnought is Washburn's most popular guitar, and features a top of laminated spruce with sides and back of Bubinga mahogany. Precision cast machine heads are standard for exact tension and positive tuning. The solid mahogany neck -- adjustable, as are necks on all models -- features a rosewood fingerboard with celluloid position marks and nickel-silver frets. Solid value and excellent tonal characteristics make this Dreadnought a first class instrument. The W-600, like the W-500, is new from Washburn for 1974. Essentially the same as the W-500, this Dreadnought features sides and back of select grade solid rosewood for an even richer tone. Totally handmade with elaborate inlay and marquetry, the W-600 is the guitar player's guitar ... the top of the Washburn line and a superb musical instrument worthy of your talents. One question: does anyone know when these Washburns first sold? The blurb for the 260 suggests it was actually before 1974.